Passage Planning Appraisal: Where to find all the Information You Need ? You know what according to me is the biggest issue right now in maritime industry? Information that is too much to handle. There is so much information and so many resources available that it can get even a sane navigator confused. But that is not the real issue. The real issue is that there isn’t enough guidance on using these resources and information. Let us come to passage planning. From company’s SMS manual to the tons of publications, there is a wealth of information and resources but not enough guidelines on how each resource complement the other. 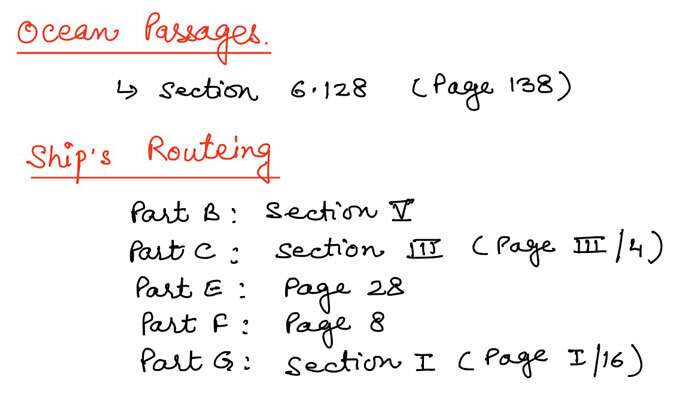 In this article, I will discuss about the initial stage of the passage planning which is Appraisal which is related to collecting the required information for passage planning. 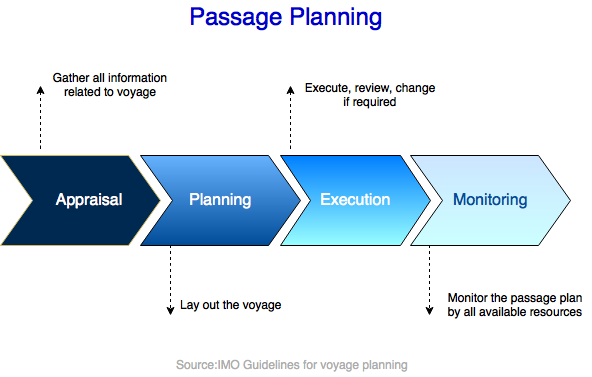 IMO resolution A.893(21) provides the general guidelines for the passage planning. 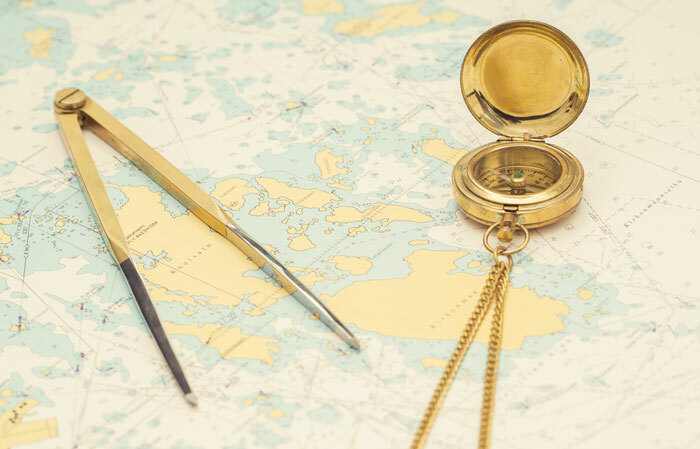 The first step for planning passage is to gather all the required information for the voyage. What is or will the vessel’s draft for the voyage? What is the minimum depth available for the voyage? Any reporting requirements during the passage? Are there any areas along the passage that need to be avoided? Are there any deep water routes that we can and cannot use? Any special routeing measures required? Once we have all this information, we can easily plan our passage. But from where can we get all this information? Of course there are tons of resources but we must know the flow of looking for these informations. That would save us a lot of time. Let us understand what resources we have to get all this information. When I get into my car for an unfamiliar destination, the first thing I see is which direction I need to proceed. Left, right or straight. I just want to get a brief sense of direction. For Oceans, this publication “Ocean passages of the world” provides the brief sense of direction to proceed. There is a wealth of information in “Ocean passages of the world”. 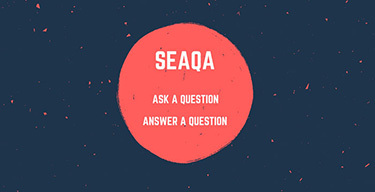 And this is the first information that a seafarer would need. The information provided in this publication is precise and helpful. So what we first need to do is go to the index page and look for the chapter that have the area (or one of the areas) for our voyage. Let us say we need to plan our voyage from Singapore to Mombasa. 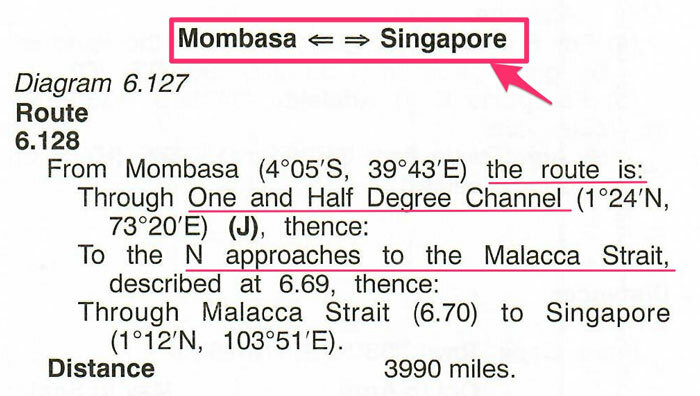 For the passage between Singapore and Mombasa, it is Chapter 6. Now go to the chapter 6 and find the best section that matches our voyage. For the voyage from Singapore to Mombasa, we have a direct section. If not, you may have to find an intermediate port between your voyage to get the route from the “Ocean passages of the world”. As you can see this has given us a sense of direction which is to pass through the “one and half degree channel”. There are even diagrams for better representation of the route to follow for different ocean voyage. Below is the one for Singapore-> Mombasa voyage. 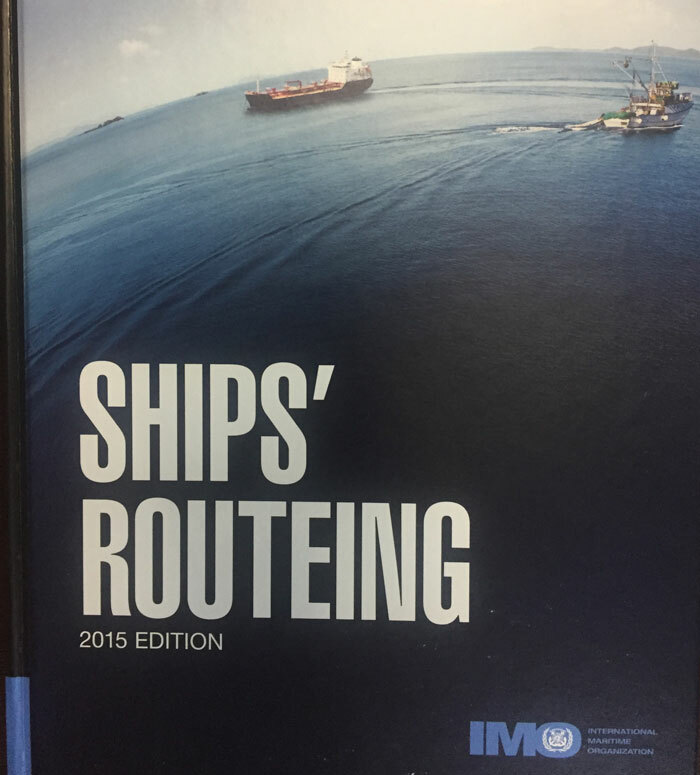 Next, you need to get your hands on this IMO publication “Ship’s Routeing”. the objective of ships’ routeing is to “improve the safety of navigation in converging areas and in areas where the density of traffic is great or where freedom of movement of shipping is inhibited by restricted sea room, the existence of obstructions to navigation, limited depths or unfavourable meteorological conditions. As you can see that is quite a handful of important information. And there is no short cuts but to dig into all this information and get the one applicable to your voyage. So under each part we need to find if there is any information for our route. 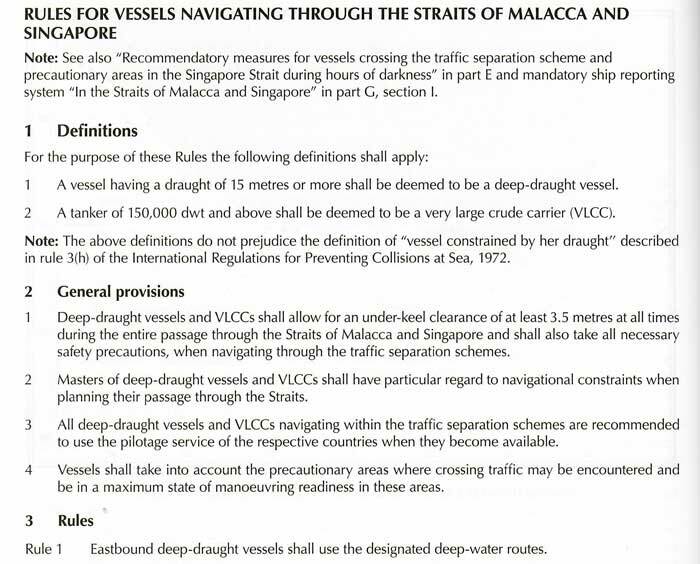 For example, under part B, we would get information related to Malacca strait TSS. 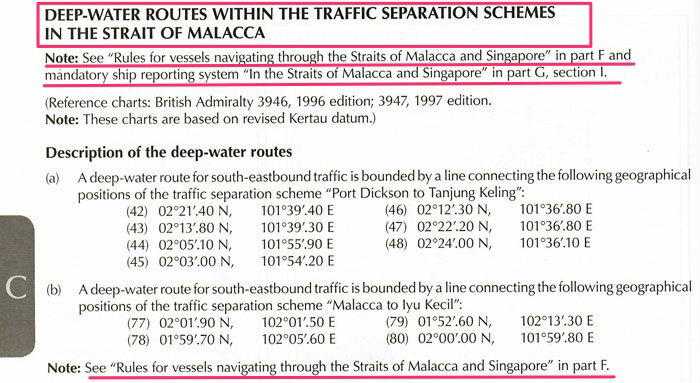 Similarly under Part C (Deep water routes), we would get the information about “Deep water routes” in Malacca strait. 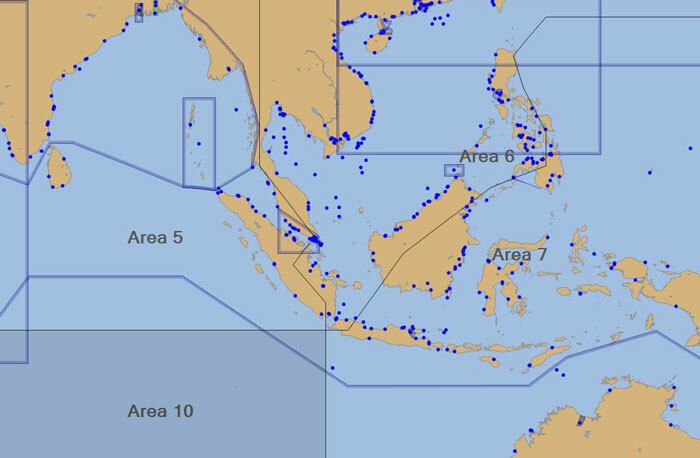 And then we can see some more information on the rules to follow in Malacca strait and mandatory reporting in Part F and part G respectively. The idea is to collect all the information available and use it for planning the passage. It is good habit to make notes of the data available for ready reference. Like the one I made below for our voyage. To plan the passage we must have the required paper charts or ENCs. If your ENC provider has the PAYS (Pay as you sail) options and you company has subscribed to it, you will have the most of the ENCs for the passage planning. The company will only need to pay when the vessel actual sails on these ENCs. Navtor is one of such ENC provider and I have covered ordering process in NAVTOR in another blog. If you have chartco, I have covered ENCs ordering process for chartco in these blogs too. So the first thing you need to do is to make sure that you have all the ENCs required for the voyage. To get the information on the required paper charts for the voyage, the procedure is not too different from ordering. 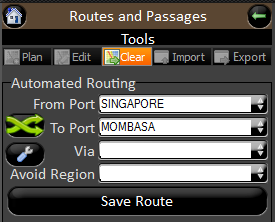 From menu, just go to “Routes and passage” option and enter the from and to ports. This will give the information on the required charts and also the charts that are no in your folio. But if your company is still in anciet world where there is no such software available, you need to do get your hands on “Chart Catalogue”. The best approach in this case is to first get the planning chart or a smallest scale chart that will have both the port areas in it. These planning charts usually should be on board. 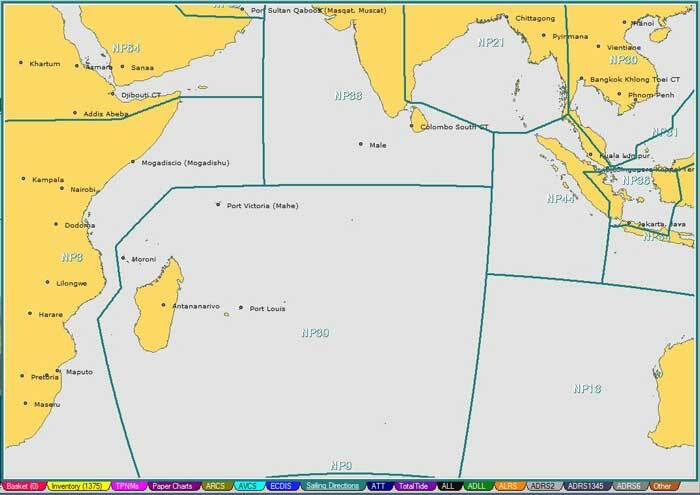 In this case we have BA chart 4071: Northern parts of Indian Ocean. 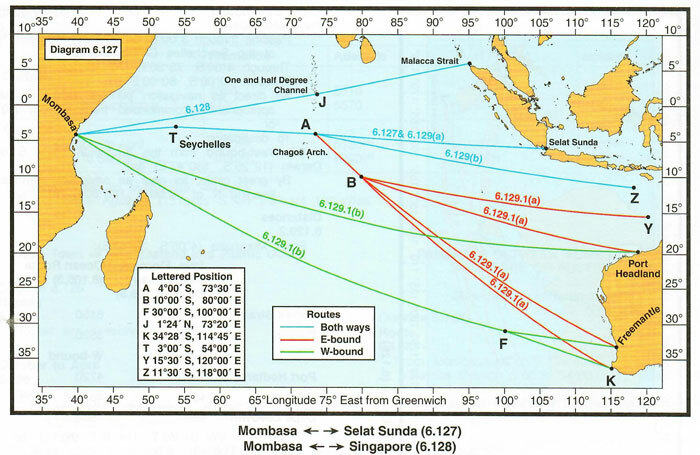 In this chart, we have Mombasa, Malacca strait and one and half degree channel too. This chart would provide the major route for the vessel. In the small scale sections of the chart catalogue for this area, with these courses we can get the chart numbers that are applicable for this route. Admiralty digital catalogue is another useful alternative to the paper catalogue. Whatever way you find this information, it is good practice to note down the charts number for the voyage in the passage planning notes. We have got all the information for our ocean route of the voyage. But we still need information on the local waterways, coastal, inshore or offshore area near to the ports or land. Sailing directions provides this information. For example to get this information, get the ASD Africa pilot Volume 3. 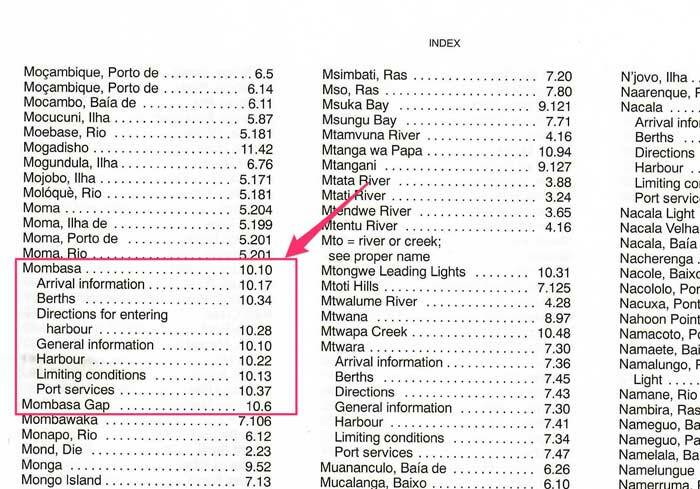 From the index of the last pages of the book, look for Mombasa. And you can see the sections applicable for Mombasa. No other way than to read these sections and apply the applicable information to the passage plan. 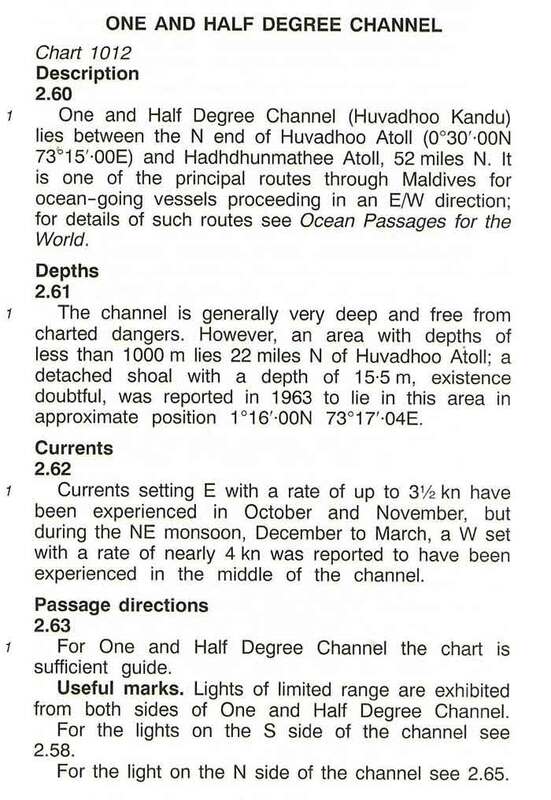 Again, note down the applicable information and sections from this sailing direction. Similarly you need to go through sailing directions applicable for other areas of our voyage. The applicable sailing directions can be found from chart catalogue or digital chart catalogue. All the applicable information need to be collected from these sailing directions and applied to the passage plan. 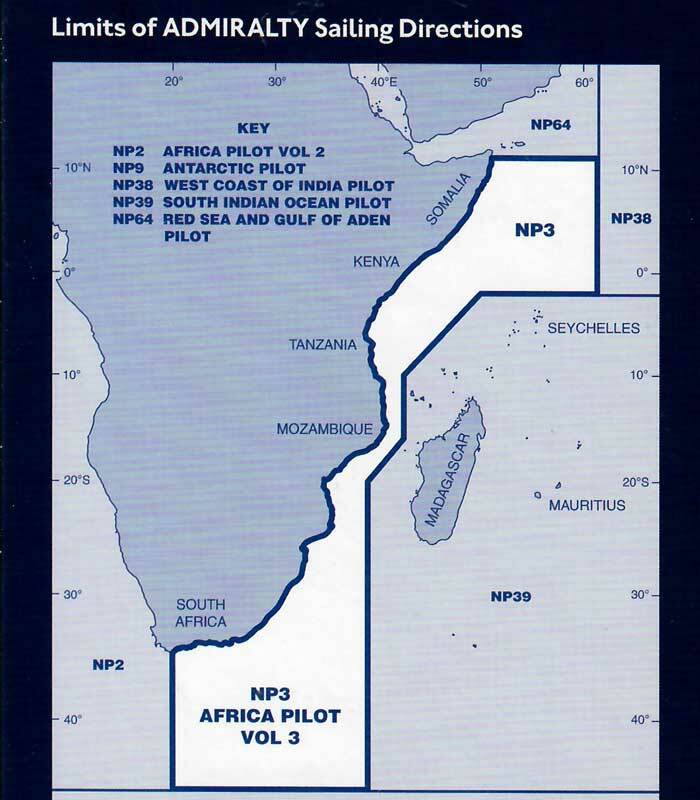 For example, NP 38 would provide information about passing through the one and half degree channel. Admiralty list of radio signals is all about information on communication. It has 6 parts. The information contained in each volume is useful for the passage. For example ALRS Volume 3, we would get the details of the NAVTEX, stations as well as the details of Navarea coordinator. This along with the times for broadcasting the navarea warnings. ALRS Volume 4 would provide similar information about Meteorological Observation Stations for receiving the weather reports. 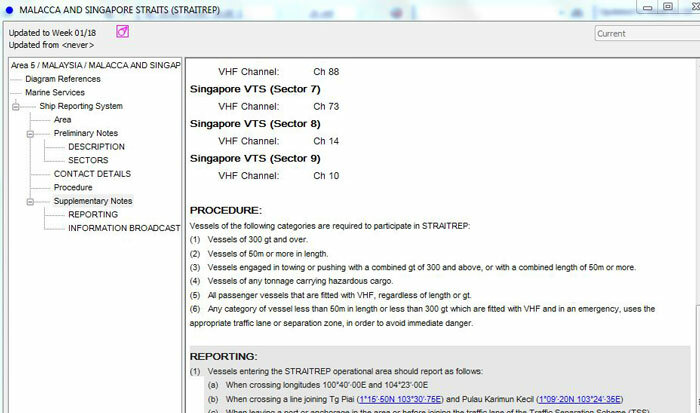 But one information that is important for the voyage planning is the information on the reporting requirements. ALRS Volume 6 (or digital ALRS Volume 6) would provide this information. If using digital ALRS volume 6, once you open it, you would see all the areas listed on the left side along with a map in the center. The blue dots on the map are all the information about reporting requirements in that area or port. 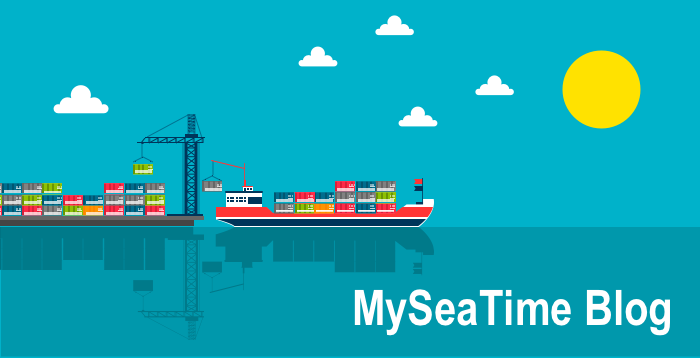 Double click on the for the port of your voyage or any area that you are passing and it will give you the information on reporting requirements. For example, when we click on Singapore, it will give the reporting information about Singapore. Data for all the applicable reportings for the voyage need to collected and need to be the part of the passage plan. 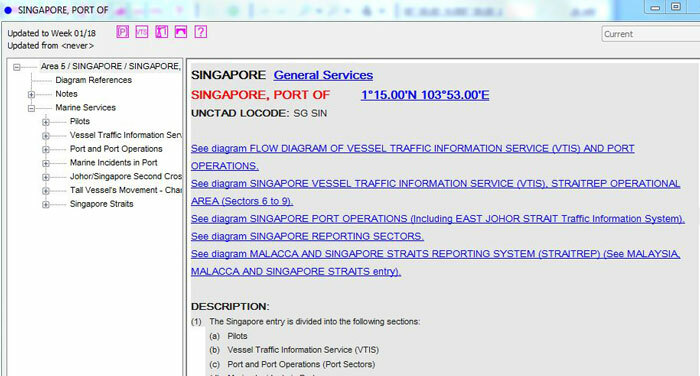 For our voyage apart from the port arrival reportings for Singapore and Mombasa, the reportings for Malacca strait will be applicable. We have found most of the information required for a comprehensive passage plan. What remains is the extensive information about the port and the terminal vessel is calling. “Guide to port entry” provides this information. To locate the information about the applicable port is simple. Just go to the country section and look for the port the vessel is calling. 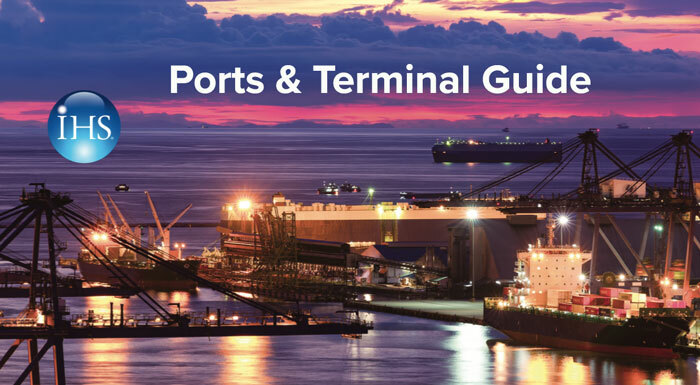 If the vessel is provided with digital port guide such as IHS port & terminal guide“, the job becomes even simpler. We just need to search with the port name and information about that port will be displayed. We have collected all the information that we need to have for a comprehensive passage plan. But this passage plan would be incomplete if we do not incorporate the company’s requirements in it. We need to go through the SMS manuals and should be aware of all the company specific requirements. Now there are many other publications and resources the information of which may only be needed at later stages. These publication need to referred as and when required. For example, for UKC calculation, vessel need to refer to the tide tables for the height and time of tides. Mariner’s handbook is a useful resource for general information about explanation of many terms and resources used on board. 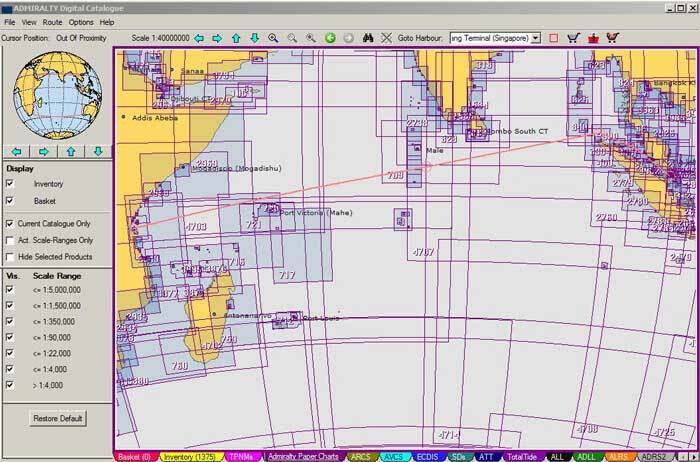 Collecting the data for use in passage planning is the most important aspect of the passage planning. This stage of the passage planning is called Appraisal. Once we have all the data for the voyage, it is relatively easier to plan a passage. Navigator responsible for creating a comprehensive passage plan need to be aware of all the resources available to him. Not only that but he/She also need to aware of what information is contained in these resources and how to use these. Very good and comprehesive artcle Capt. Rajeev. Please write more articles on passage planning, if possible all 4 stages of passage planning. Could you please shed some light on the topic regarding updating ecdis with base cd and removable drive. Is it possible to get the same complete update on the enc with the request from email on that particular enc rather than waiting for the base cd to come. Coz' there are some cells which dont activate even if we installed the permit for the particular cell, only then it will come when we installed the latest base cd/dvd. thank you sir, very good explanation, thank you very much. there are many information for me i am very weak in this subject. Sir there are some reportings in US waters which we cant find in available publications. Please provide some information regarding this. Hi sir, please keep this up. I always learn something new upon reading your blogs. Your approach is easy to understand i really like it. No. Love it. Good riddance to you sir! Glad you liked it Hasan... I will write about passage planning on ECDIS soon..
Cap Rajeev Thank you for Sharing your Knowledge around the world. i 'm looking for a Chart for Maritime tonnage and Drafts in W.africa Ports. 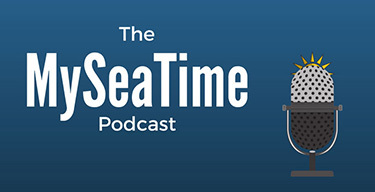 "You know what according to me is the biggest issue right now in maritime industry?Information that is too much to handle.Yes, you heard it right.There is so much information and so many resources available that it can get even a sane navigator confused. "-so damn true sir. Anyway thanks for the article. Sir, this blog was amazing and made me understand everything but can you elaborate guide to port entry, mariner's handbook, admiralty list of lights and admiralty tide table as well? That would be very helpful.